The man fatally shot by a police officer Wednesday morning after he shot the officer in his bulletproof vest was wanted for a September 2014 shooting that killed a pregnant mother of two and her unborn baby in Frankford. Devon Guisherd, 27, had been on the run for nearly a year since police identified him as the suspect wanted in the shooting of 25-year-old Megan Doto. Doto, who was due to give birth exactly a month after she was shot, was sitting outside her house on Adams Avenue near Griscom Street about noon on Sunday, Sept. 14 when gunfire erupted up Griscom Street from where she sat. A stray bullet struck Doto, who was also mother to a young daughter and son, in the face. She died a short time later at the hospital after an emergency C-section. Doctors were unable to save her baby girl, who family members said at the time would have been named Nicoletta Rose had she survived. Doto's mother, Maryann Doto, and sister, Stephanie, thanked police for tracking down her daughter's accused killer. The father of the man in the police-involved shootout says that his son knew his life was in danger when he fired at officers. "(Police) just proved to me she wasn't forgotten, and neither was her baby," Maryann Doto said. "I go to her cemetery a couple times a week, and i kept telling her, praying, that he will be caught. She was my daughter, and I love her and miss her very much." "I would just like to say thank you to the Philadelphia Police Department for never giving up on my sister and niece," Stephanie Doto told NBC10. "I prayed everyday for this day to come. I don't wish death on anyone, but Devon deserved what he had coming. My family and I finally can feel at ease knowing that he will never murder anyone ever again and that my sister and niece can finally be at peace." Doto's loved ones said Guisherd's family should be ashamed because they knew where he was hiding. 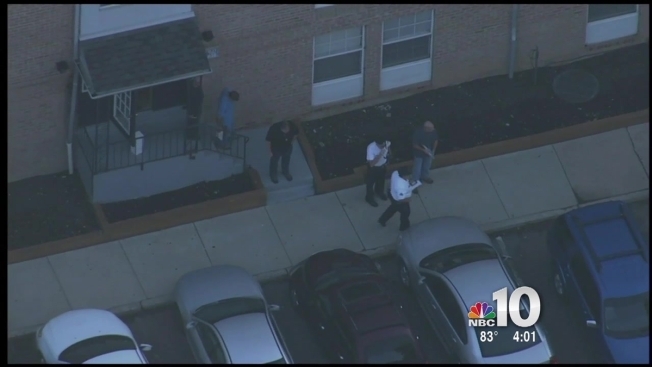 Guisherd's father spoke with NBC10's Randy Gyllenaal at his house in Frankford, a few blocks from where the shooting happened, in the wake of the shooting. David Brown told NBC10 that his son was on the run after the shooting because he believed he wouldn't get a fair trial if arrested. Guisherd's family says he wasn't responsible for the shooting. "That's why he ran, because he knew he didn't stand a chance," Brown said. When asked about his son allegedly firing at police, Brown said, "They came to get him for no reason, so I guess he knew his life was threatened. They were gonna kill him ... he knew this." SWAT and Homicide Unit officers were met with Guisherd when they went to Riverside Drive near Woodhaven Road in Northeast Philadelphia early Wednesday morning to serve an arrest warrant for him. Police said when the officers went into the apartment to serve the warrant, the suspect grabbed a gun and began to run, then turned around and shot at the officers, striking the SWAT officer in his bulletproof vest. The officer, a 17-year veteran, suffered bruising and has been treated at the hospital and released. The suspect died of his wounds, police said. Doto's mother, who is now raising her two grandchildren, thanked God for closure in the case but wished she would have gotten a chance to confront the suspect in court. "I still would have liked the opportunity to look him in the eyes, but God spared me the pain of going through the court and dealing with everything," said Doto. "He's in God's hands now."